A private picnic cruise to Orange Beach's Robinson Island is a family adventure you'll never forget. A favorite hangout for Gulf Shores and Orange Beach locals, the island is a pristine bird sanctuary and wildlife area that is open to the public to enjoy. Each summer day, hundreds of boats flock to the island for picnicking, relaxing, and fun. You'll enjoy gorgeous white sand, beautiful water, amazing views, and friendly people. Our new 26' South Bay accommodates groups of up to 12 people, has a restroom on board, and provides a safe, smooth ride to the island. 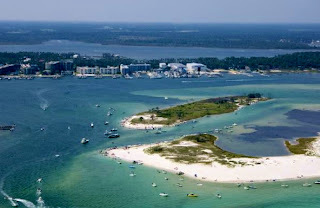 Picnic cruises depart from Orange Beach and Gulf Shores most days during the summer season (check schedule for details). Contact us today to reserve your picnic cruise!